Here's a little secret about the SHRM Certified Professional (SHRM-CP) Exam: the SHRM test is what we in the test preparation field call a content-driven test. While some tests are looking to see what you are ABLE to learn, the purpose of the Society for Human Resource Management Certified Professional (SHRM-CP) Exam, offered by the Society for Human Resource Management (SHRM), is to test your understanding of what you have already learned. The goal of the SHRM-CP Exam is to use a standardized testing process to create an objective assessment of a test taker's knowledge and skills. You can succeed on the SHRM test and become a SHRM Certified Professional (SHRM-CP) by learning critical concepts on the test so that you are prepared for as many questions as possible. Repetition and thorough preparation is a process that rewards those who are serious about being prepared, which means that succeeding on the SHRM test is within the reach of virtually anyone interested in learning the material. This is great news! It means that if you've been worried about your upcoming SHRM test, you can rest easy IF you have a good strategy for knowing what to study and how to effectively use repetition to your advantage. But it also creates another set of problems. If you tried to memorize every single possible thing you can for the SHRM test, the field of possible things to review would be so huge that you could not hope to cover everything in a reasonable time. That's why we created the SHRM Exam Flashcards Study System: we have taken all of the possible topics and reduced them down to the hundreds of concepts you must know and provided an easy-to-use learning method to guarantee success on the SHRM test. We wanted this system to be simple, effective, and fast so that you can succeed on your SHRM test with a minimum amount of time spent preparing for it. Our concept cards include in-depth explanations; you won't see any one-word answers that require you to go get a textbook to figure out what's going on. All of our cards include generous, thorough explanations so if you didn't understand the concept, you will after reading the back of the card! It's easy for a friend to help you study. They don't even have to know anything about the SHRM test; if they can read, then they can quiz you with our SHRM flash cards! 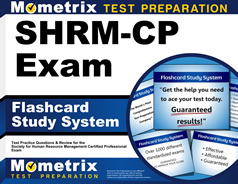 Now, let us explain what the SHRM Exam Flashcards Study System is not. It is not a comprehensive review of your education, as there's no way we could fit that onto a single set of flashcards. Don't get us wrong: we're not saying that memorization alone will automatically result in a passing SHRM test score- you have to have the ability to apply it as well. However, without the foundation of the core concepts, you cannot possibly hope to apply the information. After all, you can't apply what you don't know. SHRM Exam Flashcards Study System is a compilation of the hundreds of critical concepts you must understand to pass the SHRM test. Nothing more, nothing less. Number of views per page or views per listing for the organization’s websites, ads, etc. Remember, this is just a small sampling of the topics covered in our system. Overall, you get our premium-quality flashcards covering everything you'll need to succeed on the SHRM test. SHRM Practice Test Questions: Think you're ready for the SHRM test? Test yourself using our practice test questions. Find out if you're prepared or if you need to head back to the flashcards for another review. Use our practice test questions to make sure that you're not caught off guard on test day! Our SHRM practice test questions give you the opportunity to test your knowledge on a set of questions. You can know everything that is going to be covered on the test and it will not do you any good on test day if you have not had a chance to practice. Repetition is a key to success and using practice test questions allows you to reinforce your strengths and improve your weaknesses. Detailed answer explanations are included for each question. It may sound obvious, but you have to know which questions you missed (and more importantly why you missed them) to be able to avoid making the same mistakes again when you take the real test. That's why our SHRM practice test questions include answer keys with detailed answer explanations. These in-depth answer explanations will allow you to better understand any questions that were difficult for you or that you needed more help to understand. Special Report: The Leitner Method for Maximizing Flashcard Learning: in the 1970's a German psychologist developed a learning system that turned the humble flashcard into an advanced learning technology. His method teaches you to learn faster by playing a simple game with your flashcards, with the help of a few items you probably have around your home. Simple to learn, but incredibly effective, our free report shows you exactly how to use his method in plain, easy-to-understand language. Study Skills teaches you everything you need to know about studying, so that you can maximize the effectiveness of the time you spend in preparation and are guaranteed to get the results you deserve on test day. Study Skills is an in-depth, comprehensive study manual and is here available completely free along with your regular purchase of a copy of our SHRM Exam Flashcards Study System. How to Overcome Test Anxiety: Do you get really nervous before important tests? If so, you could be suffering from a mild form of what's known as test anxiety. This special report on test anxiety gives you important research, including our exclusive tips on how to make your test-taking experience as stress-free as possible while maximizing your score. We stand behind our offer with a no-questions-asked 1-year guarantee on our products. So go ahead and order your copy of the SHRM Exam Flashcards Study System from this site today. Read them, study them, and profit from them. If you don't think they are helping you prepare for your SHRM test, you can return them for a 100% refund of your product price, no questions asked. We think that speaks volumes about our confidence in our products. We are also members of the Better Business Bureau. If you think there's even the smallest chance that these flashcards will help you, you owe it to yourself to try them out. Don't let fear or doubt stand in the way of what could be your best opportunity to achieve the test score you need to fulfill the dream you deserve. What we're saying is, don't decide now if these flashcards are for you. Just get them from this site and try them out. If they don't do everything we say and more, if you don't save money, time and frustration, if they aren't what you thought they were, if they don't work for you, you have nothing to worry about because you can get every dime of your money back under our no-loopholes guarantee. So you have nothing to lose and everything to gain. Our belief is simple: either this product helps you or you don't pay. Period. No gimmicks, no asterisks. If you have any problems or questions, please send an email to support@mometrix.com and we will usually get back to you within 24 hours. If you would like to order through the mail, click here to order SHRM Exam Flashcards Study System by check or money order. Disclaimer: Mometrix Test Preparation is not affiliated with or endorsed by any official testing organization. All organizational and test names are trademarks of their respective owners.